Even a complete non sewer should be able to manage the few stitches needed to modify a sock leg to make a knit skirt for a doll. Shown here is a skirt in 1:9 scale made from a 6-12 month size toddler sock in the Wild Hibiscus Pattern from Robeez. These socks come in sets which are easy to use for co-ordinated clothing scaled for miniature dolls. The skirt shown here matches the hooded sweater which is a slightly more involved project also suitable for a beginning sewer. The Brenda Breyer doll modelling the clothing is a difficult doll to fit, with a large bust, tiny waist and enormous hips. The fact that these clothes are easy to fit to difficult to cloth dolls makes them a great project for beginning sewers. This project is very easy for a beginning sewer to make as it uses only a few stitches on either side of the waist, and a simple hemmed channel for elastic. It uses the top of the sock leg as the bottom hem of the skirt, saving finishing stitching. As any design on the sock will be shown upside down on the skirt, you need to find a sock with designs that are not directional, if you want to save yourself the trouble of handsewing a hem. To choose a sock for a skirt for your doll, look for a sock with a leg wide enough to easily fit over your doll's hips. Try to find a sock which has a leg that will make a skirt the correct length for your doll. You can easily shorten the sock leg to a suitable length, but if it is too short for your doll to begin with, it won't work. In the photo on this page you can see how the sock leg was cut from just above the heel of the Robeez toddler sock and turned inside out to begin the process of making the skirt. If you can't decide which length to cut the sock leg, open the sock along the seam at the toe, and fit your sock over the doll, checking the length of the leg to the heel to decide where you want to cut the sock for the skirt length you prefer. Once you have cut your sock leg to the correct length for a skirt for your doll, turn the sock inside out and fit it over the doll to the doll's waist.Use pins to mark where the sock needs to be sewn for side seams that will adjust the width of the sock between the doll's hips and waist. For a doll like the one shown here, the waist will need to be taken in even more with elastic as the difference between the hips and waist is large, and if you sewed the skirt without elastic, you might not be able to leave a wide enough opening to slip the skirt over the doll's hips. For some dolls (toddler style dolls like many tiny ball joint dolls, lati yellows, whites and puki pukis, you will not need to sew a waistband, the stretch of the sock leg will hold the waist on most of these dolls. When you have the pins in place evenly on both sides of the sock leg to indicate the line that needs to be sewn between the waist and the hips, slide the sock leg off the doll, keeping the pins in place. The photo on this page shows the seams stitched in place on the doll, but that is done flat, in the next step. The stitches on the sides of the sock at the doll's waist should be sewn with a simple backstitch. If necessary you can draw a pencil line on one side of the folded and pinned fabric to mark where the line of stitching should go. If your sock is too wide for the skirt you want for your doll you may need to stitch all the way down the side of the sock to make a full skirt seam. Make sure the shape of your seam on one side of the sock, matches the shape of the seam on the other side of the waist. If your sock fits your doll well enough to serve as a skirt without a side seam, only stitch the section from the top (widest part) of the hip to the waist. Before you clip the seams, test fit the skirt on the doll (wrong side out) to make sure the stitched sock will fit the doll correctly. Once you have checked the fit,trim the excess fabric away from the seam, leaving roughly 1/8 of an inch for the width of the seam allowance alongside the seam. Most toddler / baby socks are knit so that the fabric will not ravel when torn or cut. To make sure your seams stay secure, treat the edge of your cut fabric with a thin line of PVA (white) glue, or use fray check to seal the seams. You can use fray check or a thin line of pva glue on the cut waist edge as well to hold the knit. To finish the knit doll skirt you will need to hem the waistband. For small scale dolls, like the one shown in this tutorial, The waistband can be simply rolled over and stitched in place. If necessary to fit the doll, you can hem the waist edge to make a casing for elastic. For larger dolls you may want to sew a ribbon to the waist edge, sewing so the ribbon and the knit are "right sides together", then turning over the ribbon and stitching it to the underside of the skirt with hemming stitches. To Make and Elastic Waist - As shown here, the difference between the doll's waist and hip measurements make it important to add elastic to the waist so the skirt will fit over the doll's hips and not gap at the waist. For small dolls, use fine swimsuit elastic if possible. As shown here I used a doubled length of elastic cord, but if flat elastic is available and will fit your doll, that is preferable. Knot a section of elastic (so that it won't slip back through the casing as you sew) and starting in the center back of the skirt,lay your elastic along the waistband edge. Take a stitch through the cut waistband edge, then take your needle through a couple of threads below the elastic taking care not to catch the elastic with your needle or stitches. Take the needle back up through a loop stitch on the cut edge, then take a stitch through the sock below the elastic, using the stitch to gently pull the waist edge fabric over the elastic in a hem. Keep stitching all the way around the waistband, pulling your elastic every once in a while to check that it still moves freely under the turned down waist edge. 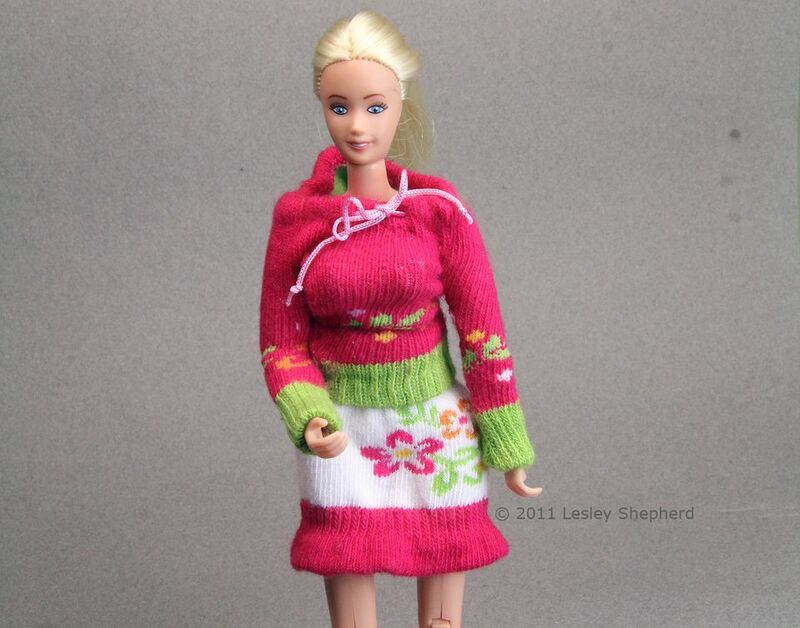 When you reach the back of the skirt again, fit the skirt on the doll (right side out) and pull on the ends of the elastic to adjust it to the correct length to fit the waist of the doll. Tie a knot in the elastic and remove the doll skirt.Sew the ends of the elastic together just at the knot and untie the knot and trim off the excess elastic. If you used elastic cord, it is enough to tie a neat square knot in the cord and trim the elastic before covering the sewn or knotted end of the elastic with the final section of the waistband edge.